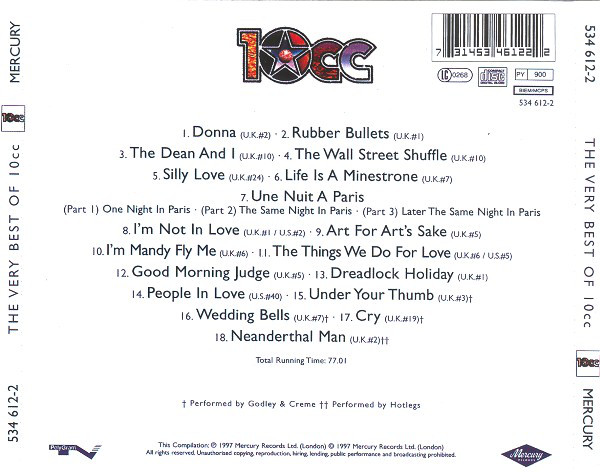 10cc were a most innovative, ground-breaking group, and one who were virtually impossible to categorise. Their music was a veritable cornucopia of influences from The Beach Boys to The Beatles to Sparks to Paul Simon and even some heavy rock riffage at times. They were exceptionally talented musicians and had a real knack for coming up with a killer, commercial hook to match their wry, witty and clever lyrics. They produced some genuinely quirky albums that need many listens to fully "get" them, but what was never in doubt was that they could come up with absolute copper-bottomed quality singles, all of which are on this excellent compilation. Their time in the limelight was 1973-1981 and during that time they garnered considerable critical acclaim, although they also had to fend of accusations of being "too clever", "too smart for their own good" and the like. An arrogance and a feeling that they were superior to many of the other chart acts around at the time didn't help their case. Personally, I also found singer Lol Creme's cod-American accent on tracks such as "The Dean And I" intensely irritating. 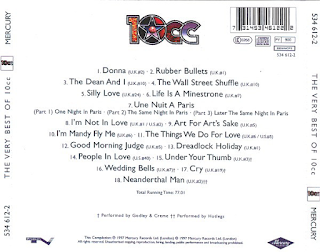 That was 10cc in a nutshell, very talented, very interesting, but a tad annoying at times. The compilation here is a superb litany of great, quirky, inventive hit singles - the huge number one rock'n'roll influenced "Rubber Bullets"; the riffy majesty of "The Wall Street Shuffle" and "Silly Love"; the lyrical lunacy of "Life Is A Minestrone"; the delicious, smoky romance of "I'm Not In Love"; the rocking, catchy "Art For Art's Sake" and the epic, many mood changes of "I'm Mandy Fly Me". 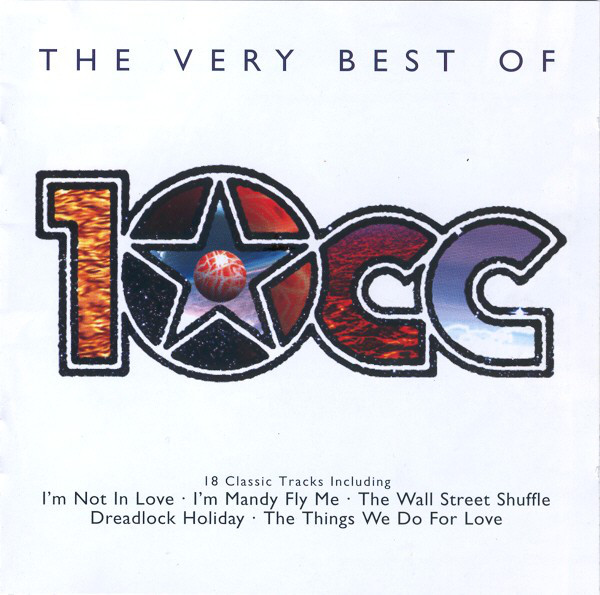 The pure pop rock of "The Things We Do For Love" and "Good Morning Judge" are excellent later hits, and then there is their final big number one, the reggae pastiche of "Dreadlock Holiday". Also included are some of Kevin Godley/Lol Creme's appealing later solo hits - "Under Your Thumb", "Wedding Bells" and "Cry" and also, enjoyably, the pre-10cc and deliciously bonkers "Neanderthal Man" (recorded under the name Hotlegs"). 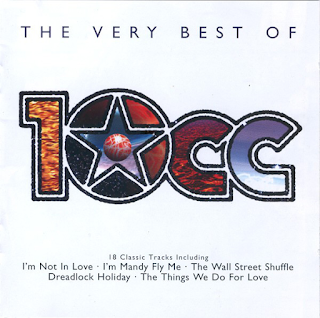 The sound quality is good and if you don't wish to delve further into the challenging world of 10cc's albums, then you can't go far wrong with this, some of the seventies' most ground-breaking pop music.